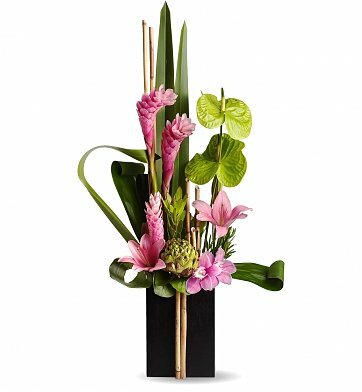 Transport someone special to beautiful, calming place with this exquisite tropical bouquet that towers high with fresh exotic blooms. Gorgeous flowers such as orchids, pink Asiatic lilies, striking green anthuriums, leucadendron, ginger, and more tropical are hand-arranged in a contemporary box container. Tall and striking, this grand bouquet makes an unforgettable gift for any special occasion. Measures approximately 22" x 38". Sense of Zen Bouquet is a hand delivered gift. These gifts are delivered by one of our local design centers located throughout the United States and Canada. Same day delivery is available for most gifts when ordered before the cutoff time. The cutoff time for Sense of Zen Bouquet is 2 PM in the recipient's time zone. It was a little tricky getting it delivered, but you made it special and renewed my trust in selecting and purchasing online. The bouquet was beautiful and it was exactly what I wanted. You went the extra mile to get what I wanted and I thank you for that. I upgraded this to the next level 'better' and was blown away at how upgraded it was. It came with a bigger vase, StarGazers, and looks and smells fantastic. 6 days later still looks as good as when we received it. My Fiancee was thrilled to get it on her birthday. I also liked that they hand wrote my note to her vs. generic typing which looked much more personal. Highly recommended!